The addition to the album title indicates already, who is responsible for the making of this album. Seren Rosso is a multi-instrumentalist and vocalist from our beloved Italy. Strangely he is only credited for the lyrics and compositions on the symphonic, gothic rock opera he produced. The musicians that are credited are Emanuele Bodo as guitarist and bass, Davide Cristofoli as keyboard player and responsible for the orchestration, Nalle Pahlsson as bass player and Mattia Garimanno who plays drums, bass and keyboards. The vocal parts are divided between lead vocalist Kevin Zwierzchaczewski, guest on two songs Isa Garcia Navas and the choirs of Eleonora Zandarin on two tracks. Even though the album is labelled as gothic conceptual rock, the music remains quite modest and “simple” if I can use this word without stepping on anyone's toes. The straight forward character of the songs is a big plus, because it makes Kevin Zwierzchaczewski dark voice perfectly stand out in the music. His dark voice fuses Tiamat's Johan Edlund with Moonspell's Fernando Ribeiro and also shows hunches of Nick Holmes, vocalist for Paradise Lost. The Captain is the smooth and perfect opener for the album, an accessible track that will appeal to a broader audience than the gothic scene alone. During the following; The Dark Room elements of Steven Wilson occur, mainly during the keyboard sections. Throughout those two tracks the subtle choirs of Eleonora just add a nice finishing touch. Former Therion vocalist Isa Garcia Navas takes In The Abyss Of My Heart and Such A Lot to the symphonic and orchestrated side of gothic rock, which combines pretty well with Kevin's vocal style. Although the music is quite kept basic, there are some nice progressive rock elements during the guitar parts, listen to the progressive rock movements during Crows In The Air and Hiroshima. I guess the track that should appeal the most to the progressive rock community will be Cygnets Committee, where elements of Genesis and Pink Floyd get a gothic treatment, which is brilliantly done. The album's final real track is an eight minutes lasting gothic epic; featuring intense vocal parts and nice orchestrated guitars. Too bad the track turns to silence for the last minute and a half.. For the people who are curious how Seren Rosso records the basics of a track, before the musicians take over and play their parts or just add the finishing touch, the bonus track To The Cygnets Committee forms a nice addition to the album. The rough recording with his own vocals in a charming Italian English is a very nice gesture, but doesn't add anything to the concept of the album. It has been a while, since I listened to gothic music. 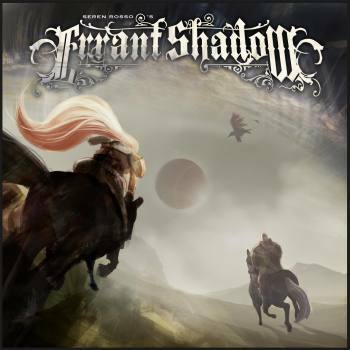 The three bands mentioned as vocal references, are minimally represented in my collection, but I have to admit, Seren Rosso's Errant Shadow tuned out to be a pretty decent album. Perhaps the die-hard gothic rock fans, have heard it all before, but for the progressive rock fan, this is a very nice album to listen to.